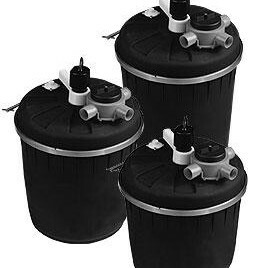 The Pondmaster Pressurized Filter System with UV features a unique, manually operated agitator for dislodging over 90% of the pond residue that accumulates in the filter chamber. This patent pending feature is employed during the backwash and rinse operation.
. Agitator unlocks waste from media saving the amount of water discharged during backwash and rinse cycles.
. Unique, patent pending 3-way master valve locks into "run", "rinse", and "backwash" settings.
. Clear-vue inspection port to monitor water clarity during backwash/rinse operation.
. Positive pressure lock ring to ensure a tight water seal.
. Reusable Bio-Matrix Media affords maximum surface area for beneficial bacteria growth.
. 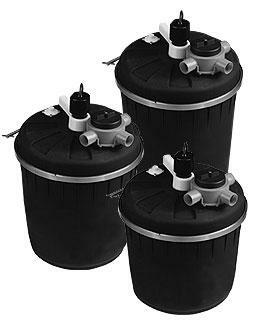 Heavy duty poly canister can be buried for hidden installation.
. Integrated waterproof UV transformer.
. Does not require a high-pressure pump to back wash. NOTE: The model 4000 ships as UPS Oversize1. Additional freight may apply. Also available without a UV.